I'll be doing a basic Birding 101 class on how to identify bird species. Whether you are 8 or 80, you can learn to identify our local birds. We'll be focusing on the fun and understanding our bird neighbors. 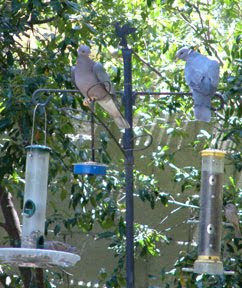 Oh, these big birds on my feeder are native band-tailed pigeons. They are locals who need our help. Before the San Fernando Valley became parking lots and housing tracks, before the citrus and walnut orchards, this big birds roamed under oak trees swallowing acorns whole. No oak trees, no food for these local birds. Their numbers were low and declining, but recently they seem to be improving. 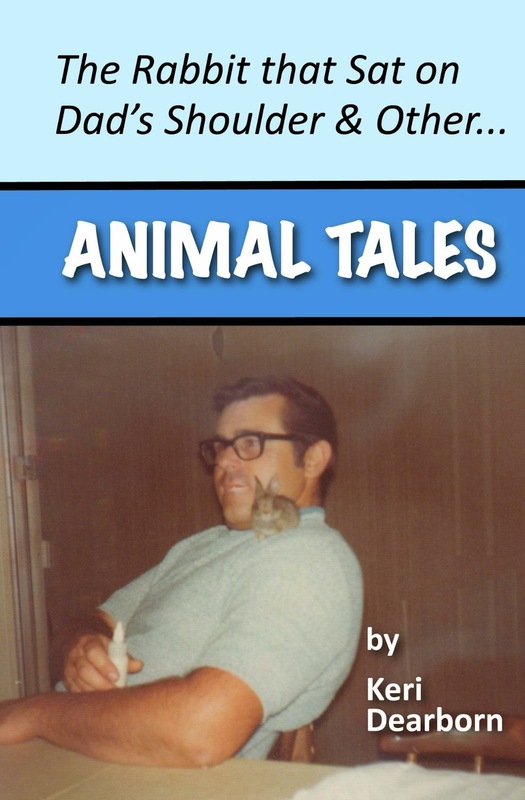 Come join me at the Woodland Hills Public Library for a FREE program and activities. Creating habitat for bird life means starting from the plants and working up. A well-planted yard provides shelter for birds, but quality habitat requires natural food sources as well. 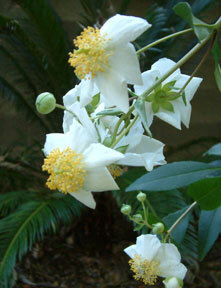 Native plants like this anemone not only provide shelter, they attract native insects. When you think of an important pollinating insect you probably think of a honey bee. But the European honey bee is not native to California (or North America for that matter). 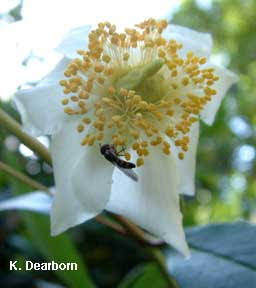 Locally we have several species of large carpenter bees and bumble bees that pollinate plants, but many native plants are pollinated by less glorified insects – flies, beetles and moths. You can see the fly feeding on the pollen on the lower area of the flower. Most native insects can only feed on the pollen of native plants. These insects are important food for larger insects, lizards and birds. Creating habitat for birds means establishing an environment safe for insects–flies and beetles, as well as the more beautiful butterflies. See crane flies. Plants and arthropods are the foundation of habitat. Arthropods include insects, spiders and crustaceans (those little "c-shape" creatures that hop about on the ground when you lift up a pot, and yes, they are related to shrimp). 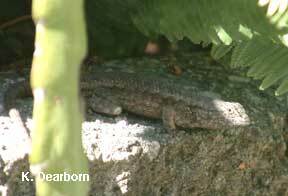 Birds and lizards can establish thriving populations if your yard offers these vital resources. John Fitzgerald of Cornell University spoke last week in Los Angeles on bird conservation. He pointed out that the areas where eastern wood thrushes have declined coincide with areas of increased acid rain. The acidic rain kills the native crustaceans in the plant undergrowth, thereby removing an important food source for the wood thrush. Having a healthy population of creepers and crawlers, supports a healthy population of runners and fliers. This western fence lizard not only eats its share of insects it also is makes your yard more healthy for you (fence lizard and Lyme's disease). 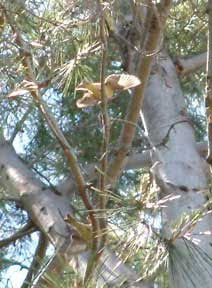 Healthy fat lizards are also potentially a food source for red-shouldered hawks, shrikes and other birds. If you want to help birds, you need to reexamine your ideal garden. Paradise isn't sterile. The Earth's garden is filled with abundance and diversity, including spiders, aphids and grubs. Not all migratory birds are beautiful songbirds, like warblers and orioles, or dynamic shore birds like sandpipers and ducks. Turkey vultures are migratory birds too. We are just seeing the tail end of the groups that fly through Southern California headed north and east for the summer. The west end of the San Fernando Valley provides numerous stop-over sites for these under appreciated birds as they return from southern wintering grounds as far away as South America. Though the turkey vulture has a large wingspan–68 - 72 inches–most only weigh between 3-6 lbs. Their light weight body and wide wings enable them to travel great distances without flapping a wing. 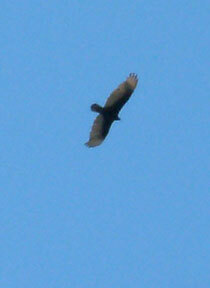 Turkey vultures can soar great distances riding the thermals in the air currents 3-4,000 feet above the ground. The upturned "V" shape of the wings acts like a kite and it is a clue that the bird you are watching is a turkey vulture and not a hawk. Hawks tend of hold their wings more flat. For turkey vultures a stand of large trees is an important temporary roost during migration. These birds may not be beautiful in a Western tanager sense, but they are vital components of a healthy environment. Turkey vultures eat the dead and help complete the cycle of life. The site of a turkey vulture overhead is a hopeful sign for a healthy environment. I have a conflict of interest in May. Birds are nesting and the city of Los Angeles requires the cutting back of vegetation for wild fire abatement. Actually, I've been trimming back greenery for the past few months. It takes me a while because I have to be very careful not to disturb or destroy bird nests. Dead trees are the first thing on the Fire Department's removal list. But at both my local Serrania Avenue Park and while leading a bird walk at the Los Angeles Zoo, I've seen woodpecker and titmouse nests in just such unwanted dead wood. When we remove all of the old wood, these cavity nesting birds are impacted by a lack of nesting sites. 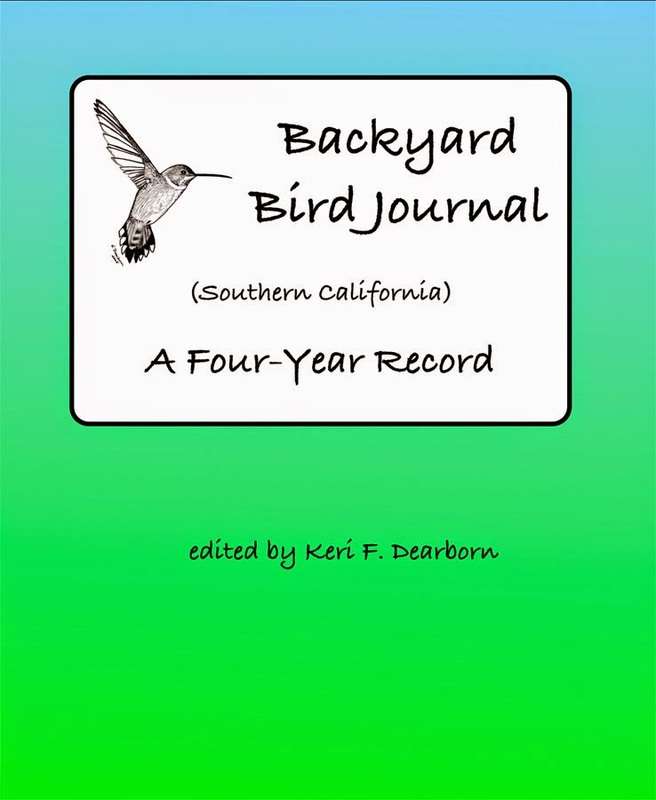 Our own yard has been a twitter with fledglings–3 Bewick's wrens, 5 Allen's hummingbirds, an Anna's hummingbird, 5 lesser goldfinches, a California towhee and an oak titmouse. I thought most of the nesting was coming to a close in the yard because the last week has been edge-of-summer warm. 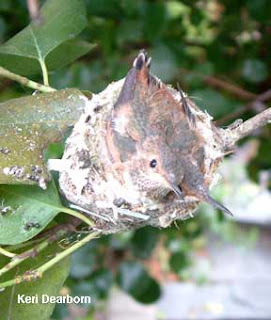 But I looked up on Wednesday and noticed a short beak sticking out of the nest where the Allen's hummingbird DR successfully fledged her first chick in February. This female Allen's hummingbird is close to successfully raising 5 chicks to flying all in the course of 5 months. She laid her first two eggs in this nest in mid-January. First Chick Fledges. Her second nest was in another holly-leaf cherry over the sidewalk. Now she is back using the first nest with slight additions. It's a good example of why you shouldn't remove bird nests. Many are reused or the materials are scavenged and reused. Somehow I missed the laying, incubating, and hatchling stage this time around. Here were two chicks with the beginnings of primary feathers tucked tightly into a reworked nest. The holly-leaf cherry that is home to this nest needs to be thinned. In fact, it was on my list for last weekend. But trimming this shrub now would threaten these two young hummingbirds. Before I start to trim a tree or shrub I stand back and watch it for a few days. Is there a bird frequenting a specific area of that plant? Has there been a nest there in the past? As I trim I try to go slowly and pay attention for activity or youngsters I might have missed. Obviously the best time to cut back plants is after nesting is over in the fall and winter, but the city requirements don't coincide with the needs of wildlife residents. Besides, a great deal of plant growth has occurred since our spring rains. Maintaining sanctuary for wildlife can mean maintaining a delicate balance between animal needs and human needs. 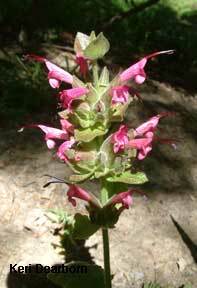 Wild fire is a serious problem in Southern California, but fortunately native plants are now seen as beneficial and not just as fire fuel. The Fire Department even gives out native holly-leaf cherry and oaks for people to plant. When trimming your plants remember that other creatures may be dependent on them. If you want wildlife to make a home in your yard, you have to respect where they build those homes. An important element of bird conservation is being aware of trends regarding population numbers, migration patterns and nesting success. In February I focused my sustainable living practices on understanding my local biodiversity - Green Action #2. 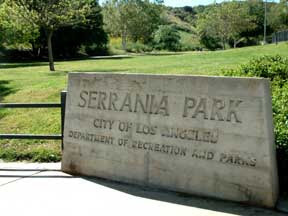 Since then I have been doing weekly bird counts at my local Serrania Avenue Park. When you look at these photos, it may be hard to imagine that this park is in a suburb of Los Angeles, the San Fernando Valley, with over 1.75 million people. But less than a half mile away, at the base of the hill in the distance, is one of the busiest freeways in the world. The trees mask the houses between the park and the Ventura Freeway (101). 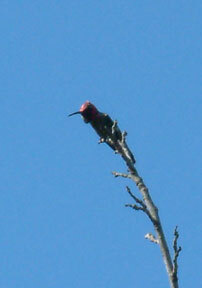 Despite its proximity to a large human population this park is an important habitat for a variety of birds, like the Anna's hummingbird (pictured), Nuttall's woodpecker and northern flicker. I typically see 25 - 35 species in an hour walking along a half mile path. A number of species nest here including: oak titmouse, bushtits, Anna's and Allen's hummingbirds, black phoebe, lesser goldfinch, Northern mockingbirds, California towhee, spotted towhee, Bewick's wren, mourning dove, California quail and scrub jays. 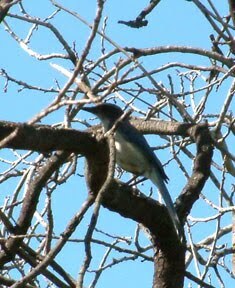 The park was an important area of survival for the scrub jays (pictured) when populations living in the surrounding suburbs were killed by West Nile virus several years ago. 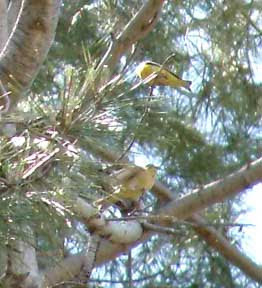 Migrating birds also have been arriving and nesting as well, including: western bluebird, Cassin's kingbird, California thrashers, and recently Bullock's and hooded orioles. This year we also have a nesting pair of blue-gray gnatcatchers. The male phainopepla arrived last week, but he is still without a mate. Because fingers of the park reach up into the foothills of the Santa Monica Mountains, there is a crossover of suburban and chapparal bird species. 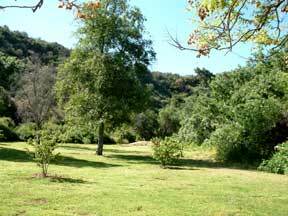 Large birds of prey, red-tailed and red shouldered hawks, as well as Cooper's hawks and great horned owls hunt here. Once I even saw a bobcat stalking desert cottontails. I am logging in my observations every week on eBird and NestWatch. Not only am I discovering the patterns of migration and nesting at my local park, I am also acting as a citizen scientist. My data is available to scientists and biologists looking at localized patterns and continental patterns. More Citizen Science Projects. One thing I have realized is that nests in the park are threatened by predators either introduced or increased because of human activity. So far I have documented two bushtit nests and both have been destroyed by predators. One nest may have been robbed by ravens, which have increased dramatically in our area over the past 5 years. The other was destroyed by a fox tree squirrel, which is an introduced species. Our tree nesting birds did not evolve with these aggressive squirrels. These fox tree squirrels are cute, but feeding them increases their population and expands their territory. With that comes increased threat to nesting native birds. 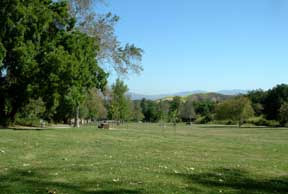 Serrania Avenue Park is a wonderful place to bird for California chapparal species. Access is easy and the birding is bountiful. Check out your local park, you may be surprised at the number of wild animals in your own neighborhood. I will be one of the walk leaders. An opportunity to hear the Director of the Cornell Laboratory of Ornithology and professor in Ecology and Evolutionary Biology at Cornell University discuss the vital roles that birds play in fostering conservation of worldwide biological diversity. I will be giving a FREE presentation on identifying local birds and nests. Beginners and children are encouraged to attend. There will be activities and fun. It is a beautiful spring day. The breeze softly moves through the vegetation nodding the hummingbird sage. The thermometer is tickling summer temperatures, but the air still has a gentle breath of moisture. As you’ve seen in my posts on Bewick’s wrens and Allen’s hummingbirds, I am committed to providing habitat for local bird species. This month I’ve decided to focus on my daily activities that have a direct effect on the wildlife I encounter every day - birds. You may not think of a crow as a wild animal, but it is. For most of us living in cities or suburbs, birds and insects are the wild creatures we have the greatest opportunity to interact with every day. This morning I saw three lesser goldfinch chicks, just out of the nest. Notice their beating wings. They were noisily begging for food from their parents. You don't have to watch TV to witness wild animals being born or interacting with their young. My intention this month is to identify ways I can support bird conservation at home and afar. May is also the month of International Migratory Bird Day. As the world focuses its attention on birds, maybe you should too.